A new book by one of the “old masters” of science fiction is almost always a good cause for celebration. That call echoed in the mind of anyone who had seen 2001: A Space Odyssey, or read the book. And naturally, it echoed in the minds of every citizen of Clarke’s universe for a very, very long time; somewhat like Armstrong’s “a giant leap for mankind” in our own universe. Clarke is apparently aware of the effect such strong one-liners have on readers, and does not fail to provide a line that is nearly as powerful in this latest addition to the Space Odyssey series. Here, too, the phrase is made by Dave Bowman -- and his good old friend HAL. Back in 2001, astronaut Frank Poole was kicked into deep space by the apparently insane shipboard computer, HAL 9000. Nearly a thousand years later, his body is recovered by a crew of space workers, near the reaches of Neptune, on its way to leave the Solar System. Using the techniques available in the year 3001 AD, Poole’s body, which the cold of space kept nearly intact, is revived. Thus Poole begins a new life, a living museum exhibit, as what he terms “a stranger in a strange time”. I hope, Poole told himself, that confidence is justified. Someone once said that any sufficiently advanced technology is indistinguishable from magic. Will I meet magic in this new world -- and be able to handle it? Roughly half the book is devoted to Poole’s view of life at the beginning of the fourth millennium. Through his eyes, we see Clarke’s detailed predictions for the future of mankind, both technical and historical. The second half of the book is the actual plot, which I’m afraid most 2001 fans will find to be highly disappointing. Where 2001 had vision, and hopes, in terms of mankind reaching a new step in their evolution, 3001 regards the monoliths as nothing but huge, mechanical, non-intelligent computers. Clarke himself notes (in the postscript) that each of the four Space Odyssey novels is set in a slightly different universe; in other words, he freely allows himself to disregard several facts from the previous novels. One stark example is the aliens' capability for faster-than-light travel, seen when Dave Bowman enters the “spaceport” at the Monolith; this capability is gone in 3001. The plot is highly disappointing: Clarke is (ab)using the 2001 universe as a mere excuse. The only merit lies in Clarke’s predictions for mankind’s future. Some are far-fetching and rather unreasonable (in my view), while some are rather obvious advancements of current technology. In the somewhat longer than usual postscript, Clarke discusses the background for most of the technical advancements introduced in the book. The history of mankind is also of interest, though I didn't like some of it (Poole is glad that his friend, Rabbi Bernstein, didn't live to find what happened to Israel ...) The status of God is seriously degraded, too -- in fact, “God” is somewhat of a dirty word in 3001; this however sounds too much like wishful thinking on Clarke’s side. And some elements of culture are never gone: people in 3001 are still aware of Star Trek’s “Prime Directive”; it seems like various Star Trek series kept high enough ratings to survive all those centuries. And whoever had put this collection together must have had a sense of humor, or they wouldnot have included episodes from each Star Trek series. As a very small boy, Poole had met both Patrick Stewart and Leonard Nimoy: he wondered what they would have thought, could they have known the destiny of the child who had shyly asked for their autographs. 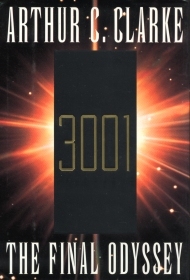 3001 is filled with references, some bold, some less, to different science fiction authors and characters. I was sad to find, for example, that in ten centuries, the three most notable female computer scientists that mankind produced were Ada Lovelace, Grace Hopper, and ... Susan Calvin. Illogical though it seemed, most of the human race had found it impossible not to be polite to its artificial children, however simpleminded they might be. Whole volumes of psychology, as well as popular guides ('How Not to Hurt Your Computer’s Feelings'; 'Artificial Intelligence -- Real Irritation' were some of the best-known titles) had been written on the subject of Man-Machine etiquette. Long ago it had been decided that, however inconsequential rudeness to robots might appear to be, it should be discouraged. All too easily, it could spread to human relationships as well. A certain FTP program that I’ve worked with responded to the “quit” command with: “The least you could say is 'Bye'!”. Several users I know, after seeing that message once, always leave that program using the “bye” command rather than “quit”, as if not to hurt its feelings. We’re talking about an FTP program here. How will people respond to the various “Office Assistants” in Microsoft’s Office suite, I wonder? Clarke’s classic work, Childhood’s End. Why do so many people find the Star Trek references jarring, as if it were inconceivable that the characters in 3001 would know about this 20th century phenomenon? Indra was a historian specializing in Poole's period, and the others have an obvious interest in the period ...working closely with Poole. I do not find that the status of God is degraded. Only the status of the name ''God'' is degraded. In the novel, even after major institutional religions have been discredited, there is still a need to refer to the divine being. ''Theus'' and ''Deus'' are the preferred names. Ironically, in Clarke's vision of the future, the name ''God'' is discredited, but humanity cannot get along without replacing it with other names for the same being (and without other theological disputes, such as whether there is no more than one god, or no less than one god). 2001 and 2010 seem to be two creation stories, like Genesis 1 and 2. They end with Europa as the Forbidden Fruit of the tree in the midst of the garden. In 2061, humans landed on Europa, touching the Forbidden Fruit. Next should be a Flood story, and in 3001, right on schedule, humanity faces the judgment of a higher power and barely survives. And we have a hint that a Tower of Babel story should come next, just like in Genesis, with the four tall towers on Earth and Anglish as the one world language. Clarke may have been creeped out by religion, but his parallel with Genesis is clear.